When I was younger (lately that seems forever ago since my back has been hurting like an old man’s), I used to watch the cartoon ‘The Weekenders‘ whenever it was on. Every so often, those kids would go to a museum to taste test a random international food. The lady serving those treats always had a punchy tag line that would stick in your head…and even though I barely remember anything about that show, I still remember a few of those rhymes. One of my favorites was “couscous: the food so nice, they named it twice”. I obnoxiously say it all the time. Actually, I’m pretty sure that rhyme turned me onto the wonderful versatility of couscous. Well anyway…blah blah blah blah blah…I hadn’t had couscous in a while, so I knew it was time to make some! It takes about 5 minutes to cook, so the only prep time needed is for whatever fun ingredients you want to add in. Personally, I like it pack it full of strong flavors because unfortunately plain couscous can be rather boring. In this recipe, the couscous is simmered with sauteed garlic, red onion, and sundried tomatoes. Oh, and some roasted cauliflower chopped up into tiny florets. The cauliflowers not only adds an extra serving of veggies, but it also gives the dish a little smokiness that you can’t get from anything else. After everything fluffs up, a sprinkling of slivered almonds gives the dish the perfect amount of crunch. Don’t skip out on those almonds. Seriously. Even if you’re allergic, figure out something else to switch up the texture. Totally needed and totally awesome. Preheat oven to 400-425 degrees Fahrenheit. Cut the cauliflower into florets (about a little smaller than you’d have on a vegetable tray at a party). Toss with 1 tablespoon oil and a sprinkling of salt/pepper. Roast for 40 minutes in a preheated oven, stirring occasionally. In a medium saucepan over medium heat, melt the butter and remaining oil. Add in minced garlic and onion, saute for 5-7 minutes or until tender and lightly golden. Add in sundried tomato, regular tomato, and a pinch of salt/pepper. Cook for 3 minutes, or until the tomato begins to break down. Stir in the roasted cauliflower and cup of water. Bring to a boil, stir in couscous, cover, turn off heat, and let sit for 4-5 minutes. Uncover and fluff with fork. 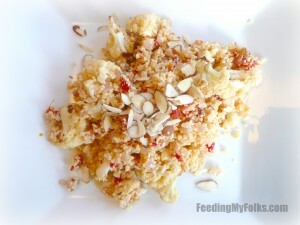 Serve with slivered almonds. Enjoy! wow this sounds really yummy. I needed a new idea to use couscous! Thanks for sharing this! 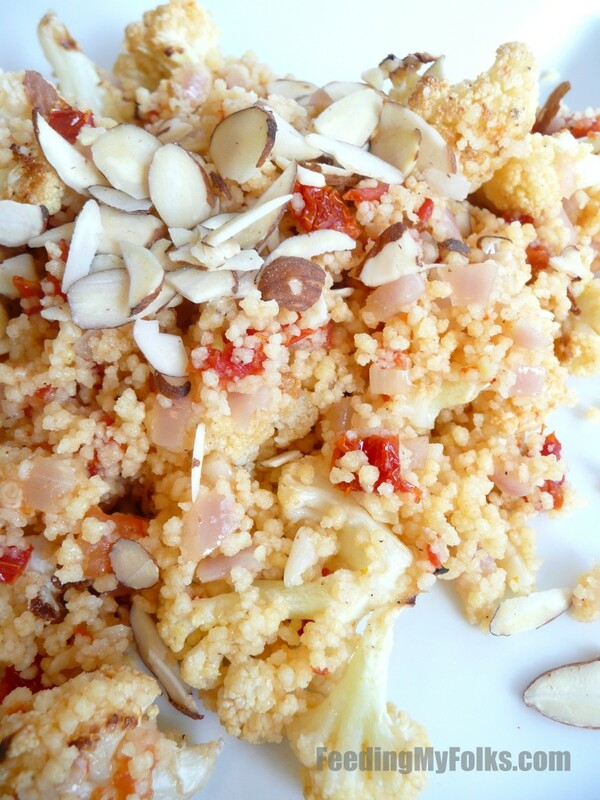 Couscous is really simple to make too. Actually…I’m having some for lunch right now (but with zucchini this time). I went to Fairway this weekend and kept walking by couscous. I was tempted to take some home and just figure it out using one of your recipes. Next time I won’t leave it behind! Definitely get some couscous (you can’t beat it’s 5 minute cook time!). Perfect for a weeknight meal…just use broth instead of water and toss in some veggies and/or protein. Simple and easy!